I can’t count how many times this exact situation has played out in my travels: Person A has some oddball pedal they consider to be his or her “secret weapon” and brags about it online. Person B knows this exact pedal, only when they played it, it looked a little differently. Both these people played the exact same pedal with different labels, but the big-time plot twist is that these pedals were often direct copies of other company’s circuits. 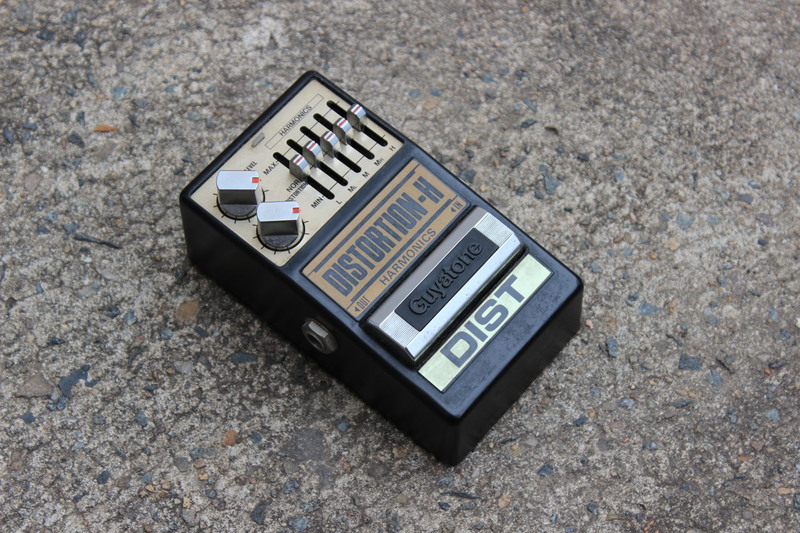 If you’ve ever played a one-knob phaser from the late ‘70s or ‘80s, made by a company you’ve never heard of, you can bet your bottom dollar that it was a copy of a Phase 90. Most overdrives were Tube Screamers, most “distortions” were just Rats, and most choruses were CE-2s. So it goes. In this era, this happened all the time. There were quite literally hundreds of companies all cranking out clones of better-selling pedals, sometimes adopting the names of beloved brand names and flooding the Western market. Back in those days, “Made in Japan” wasn’t exactly the trademark of manufacturing quality that it is today, and any company could throw down a few bucks and develop a whole line of pedals without actually having to do anything. If you’re wondering why companies like Pearl and Washburn have old pedals floating around, now you know—and many of these companies shared enclosures and other telltale components such as knobs and switches. Take for example, the Cutec AD-01 Analog Delay. This pedal was a standard analog delay, but its breadth of pseudonyms was anything but; the pedal was also manufactured under the brand names Redson, Studio Series, Gig, Loco Box, and PowerVoice. And it wasn’t just this model—there were tons of them, sold under many more names. Korg and Yamaha shared identical enclosures; cats and dogs were certainly living together in this time period. Sadly, some of these companies had true-blue engineers on staff, working hard to provide you with original, great-sounding effects, and too many truly fantastic pedals drowned with these pedal lines, many of which you’ve never heard. It’s time to put on the scuba gear and rescue these relics from the shipwrecks their lines became, and here are the eight best. I firmly believe that Multivox’s Big Jam pedals are some of the best pedals ever made. They feature an ultra-sensitive “air switch,” a bi-color LED, sliders for knobs, a super-cool low-profile look, and chiefly, they all sound excellent. The Spit Wah is probably my favorite envelope filter ever made, narrowly edging out a vintage Mu-Tron III at about a third of the size. The only problem with the Big Jam line is that exotic effects enthusiasts will end up paying an arm and a leg for some of Multivox’s more esoteric offerings. Try finding a Jazz Flanger or Parametric EQ for cheap and you’ll be looking a while. With that said, the cream of the crop is the Space Driver. The circuit board of the Space Driver is packed to the brim with components and not one square centimeter is left unused. 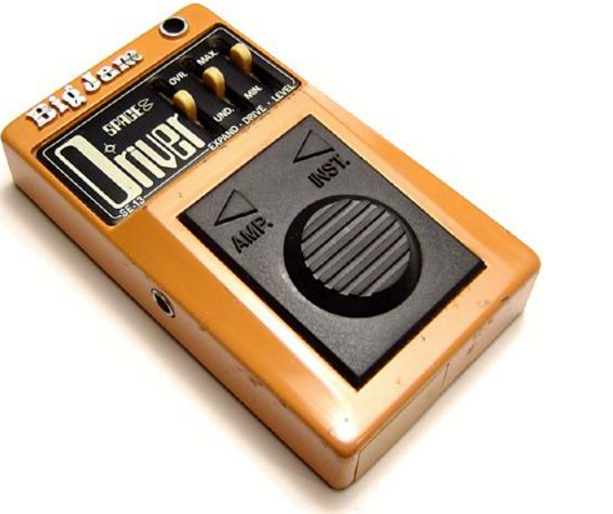 Though the control names suggest “expansion” within the sound, what is actually happening is that the Space Driver is outfitted with a modified Ross Compressor up front, which feeds into an overdrive circuit. The overdrive circuit is wonderful crunchy and sticking a compressor right in front helps you dial in some exquisite dynamics. Think about how many companies have effectively streamlined the Tube Screamer or Big Muff and you’ll soon realize what a difference they impart onto the source material. The Space Driver was one such box. The ‘70s brought the octaver to the pedal world with the Conn Multi-Vider, Maestro Octave Box and the Electro-Harmonix Octave Multiplexer. Back then, such a concept was groundbreaking (wow, two voices at once! ), but “groundbreaking” is rarely synonymous with “streamlined” and guitar octavers stumbled around in the dark with outstretched hands for two decades. The 20-year span of offerings gave us one octave down, sometimes two, or the typical ‘60s-style transformer-based upper octave. These octave-up pedals made a prospective guitarist dink around with his or her guitar controls—pesky at best. Never was there a clean analog octave-up, and these transformer-based types were never mixed with the octave-down technology. Pearl’s OC-07 Octaver does just that: it gives players four mix controls for +1, -1, -2 and “Normal” which is a dry mix control. The “+1” sounds like a soothing organ tone, where the two lower octaves sound like a punchy bass or organ foot pedal. It actually tracks pretty well, too! Though the general public at large has caught onto this pedal by now, they can still be found in local shops that have by and large dismissed these far-east pedals as junk. Though most folks know Vestax from its four-track and turntable offerings, Vestax actually started out as a guitar manufacturer, so its leap from guitars to pedals isn’t super uncommon. Well, actually, Vestax started as Shiino Musical Instrument Corporation, changed its name to Vesta Fire, then settled on Vestax. As such, many pedals were branded as Vesta Fire, and the company’s “New Series” bled over into Vestax, but the pedals were the exact same. Got all that? Most of the Vesta Fire and Vestax pedals were actually very well designed, and sound just as great. I’ve played a good number of them, but my favorite by far is the MDX Digital Delay with Modulation. The modulation circuit isn’t what makes the unit—it’s actually the time range. Most digital delay units of the day feature a delay range that bottoms out at slapback speeds—the venerable Boss DD3 goes as low as 50 milliseconds. The MDX goes as low as one. One millisecond. As you might imagine, this allows you to craft the most horrific and unique soundscapes you’ve likely ever heard—with modulation. 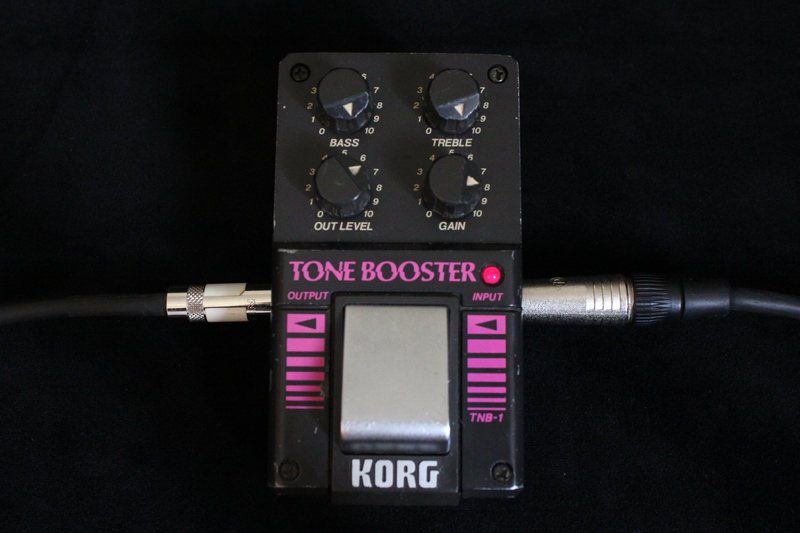 Unlike a select few manufacturers featured here, Korg is one whose ‘80s pedal offerings were unabashed undercutting clones of the highest order. The company shared enclosures and circuits with Yamaha, one of its biggest competitors in the synth world. Most of the ‘80s effects are fairly standard, with chorus, flanger, overdrive, distortion and EQ offerings represented. Funnily enough, fuzz isn’t found all too often in any of these ‘80s lines; fuzz just wasn’t cool in the ‘80s. My, how far we’ve come. The TNB-1 Tone Booster is the anomaly of the line, featuring a super touch-sensitive boost box with a two-band EQ, along with separate Volume and Gain controls. Turning the Gain knob up dials in a modicum of grit—until the final part of the knob’s range. It is then that the TNB-1 turns into a harmonic-breathing dragon that delivers boatloads of gain. Adept readers might think this is a clone of the Colorsound Overdriver, as these are the same characteristics. It isn’t—Korg’s beast utilizes a completely different circuit topology. It’s the only anomaly within the Korg line and a wonderful addition to one’s arsenal. Though some would have you believe otherwise, the Loco Box company has always been a front for a clone operation. The original line of Loco Box effects from the late ‘70s were disguised as cutesy originals, but the similarities ended with the paint job. The Loco Box originals were housed in sloped enclosures that were more-than-coincidentally used by other brands of the era, but the Loco Box stuff was considerably better looking, and thusly more collectable. One such pedal from this line is the Choker. 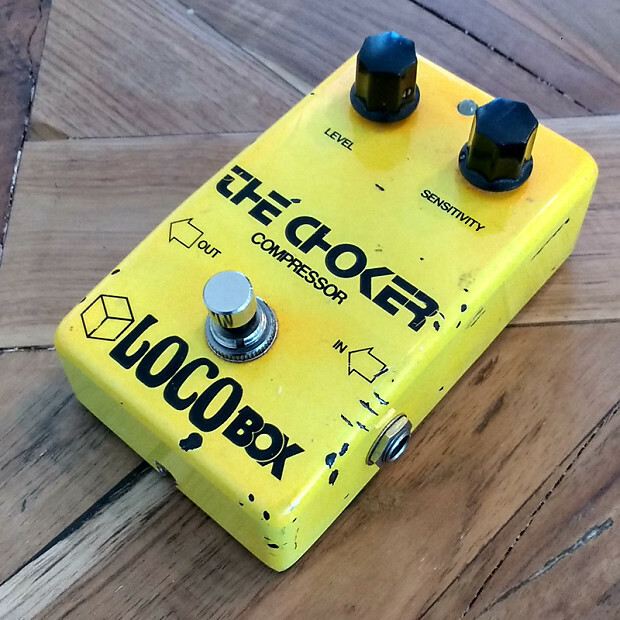 The Choker is a compressor that gained a little notoriety when Jason Falkner of Jellyfish and Beck’s band did an interview with Tape Op and declared the Choker to be the magic pedal that made all his early recordings sound good. The bugle had been sounded, and the hunt was on. Essentially, the Choker is a very finely-tuned version of the Ross Compressor, but configured in such a way that your treble content remains intact, making your guitar sound incredibly full and fat without gutting your tone. It’s an incredible box, and can be had for relative peanuts if any of the other brands will do. Years ago when I worked at my first mom-and-pop guitar shop, a customer brought in a handful of Nady pedals with the intent of selling them to us. All but two (more on that later) were average at best, but mixed amongst them was this, the PS-021 Guitar Exciter & Comp. Being well-versed in most guitar pedals and their derivatives, this one caught the entire staff by surprise. The first employee who tried it bought it after playing it for five minutes. I haven’t seen one since. The contents of the circuit are fairly straightforward—it’s a compressor up first and foremost, though the pedal calls it a “double” effect—but the idea of introducing an “exciter” into the compact pedal format is, frankly, exciting, especially for the era. The Exciter knob on the PS-021 innovatively introduced even- or odd-order harmonics when turned left or right-of-center, coaxing new flavors from your input signal and warming it up beyond warm. As a bonus, the DIY community has recently gotten ahold of an original unit, and so the legend of the PS-021 may soon grow into its due. Coron’s bread and butter was slightly modified MXR circuits. There were tons of Coron pedals, and most of the ones guitarists remember bore an uncanny resemblance to MXR’s late-‘70s offerings. 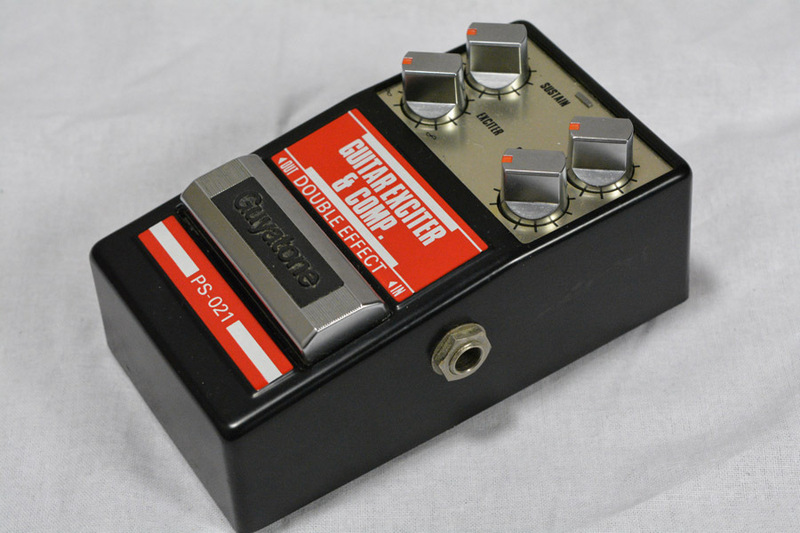 The pedals’ names were oftentimes the type of effect plus a number, and often with interesting names, such as the Sound Cutter 60, otherwise known as a tremolo. Though these pedals actually sound great and are highly collectable, they are copies by and large, and were simultaneously used by other brand names such as Memphis, Asama and others. These pedals existed in the “First Series,” but outside of that series, Coron made some real head turners. 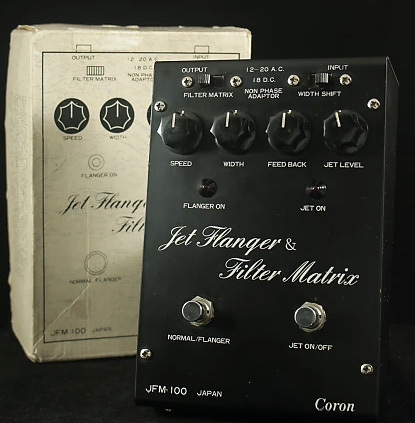 One such was the Jet Flanger and Filter Matrix. The name itself leads us to believe that it might be a rip of the Electro-Harmonix Electric Mistress, whose subtitle is “Filter Matrix,” and that’s mostly true, but the Jet Flanger gives us two crucial upgrades. One such upgrade is the Jet switch that adds in a creamy distortion when engaged, which in turn ratchets the flanger sounds up a notch and gives it that whooshy takeoff sound people normally associate with flangers. There’s also a Width slider that simply gives you more depth. The Jet side can actually be used by itself for a great-sounding lead tone right before you climb into the cockpit. As far as the Boss HM-2 is concerned, the cat is officially out of the bag. The prices on these units skyrocketed when Daniel Ekeroth demonstrated the guitar technique of Entombed’s Leif Kuzner, and how he used the HM-2 to great effect on Entombed’s classic Left Hand Path. The method involved turning every knob up as far as it would go, creating a grinding buzzsaw sound that could only find a home on Swedish death metal recordings. Many artists normally not associated with metal found a use for one too, such as David Gilmour and Eric Clapton. The Guyatone Distortion-H Harmonics was the other cool pedal from the aforementioned lot (although mine was the Nady-branded version), and is a lot like the Boss HM-2, but sounds a bit better and features a slider section in lieu of the EQ called “Harmonics.” Each slider was labeled with a letter, fooling you into thinking that some truly unique tonal manipulation was commencing, when in reality it was a five-band EQ. This is far from a letdown, however, because the idea of a five-band EQ on a pedal that normally contains two—and can be used on everything from classic rock to Swedish death metal—is quite an essential and amazing tool. You’ll never play another HM-2 again.